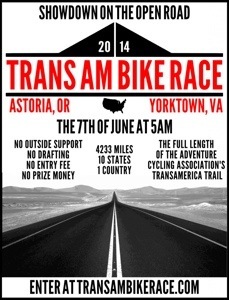 In it’s inaugural year, the Trans Am Bike Race is a solo, unsupported race across America, routing along the well trodden cycling course of the Trans American trail, established by the Adventure Cycling Association. At 4,233 miles, touching the Pacific at Astoria in Oregon it seeks out a few mountain ranges on-route, including a passage through the Rockies, before reaching out to touch the Atlantic at Yorktown in Virginia. Currently 50 cyclists have signed up and the estimates of the fastest time at 15 days boggles the mind. There’s no entry fee, prize money or support. It’s solo, unsupported (not outside help from home) and is run on a gentlemen’s agreement. I love the spirit of the race and love the idea that you’re racing along the same route, a real tortoise and hare style race. Either could win, but the strategy you take is about knowing yourself as a rider.